Cut down on installation time. Snap Table rental for larger jobs, SS675 profile only. 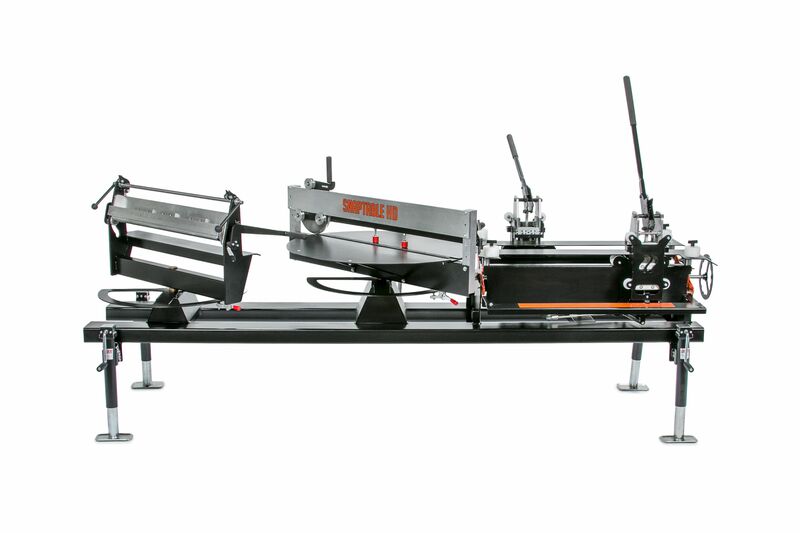 Description:The new steel SnapTable HD is the all-in-one tool fully equipped to notch, shear, and hem your snap lock and standing seam profiles. The SnapTable HD features an adjustable table width that can accommodate panels between 12-20", a notching station equipped with a slope-calibrated ruler that allows for 29" notching offset and a slitter that cuts a 33" maximum angle length slit. The hemmer allows you to make a 33" maximum angle length hem with one single pull of the handle. The SnapTable HD now features an all new degree indicator on both the Slitter and Hemme allowing you to find your angle faster. The SnapTable HD is risk-free, time-efficient, and reliable. Highly transportable, the SnapTable HD weighs 750 lbs and features built-in adjustable jacks making it easy to level the tool on any jobsite. Cutting Purpose: All-in-one Panel/Roofing tool. It notches, slits, and hems panels. Suggested maximum panel thickness, 20 gauge.